Lentils are a delicious and healthy legume, rich in essential vitamins (particularly B vitamins) and minerals. They’re high in fiber; high in iron (1 cup provides almost 40% of daily iron requirements); a great source of protein; and low in calories. This tasty salad also gives you the health benefits of spinach, onion, tomatoes and nuts or seeds. Cook the lentils according to package directions and let cool. Alternately, for sprouting your lentils, you can soak dry lentils, covering with water in a glass or stainless steel bowl in the refrigerator for 2 to 3 days (covered with plastic wrap). The lentils will soften and sprout. Change the water every other day. They will soften, sweeten and change texture to the point when their taste will tell you they're ready. In a large mixing bowl, combine lentils, onions, spinach, tomatoes, olives and walnuts. In a mixing bowl, combine oil, vinegar, mustard, garlic, salt and pepper (to your liking) and whisk together. Taste and adjust dressing to your personal preference. 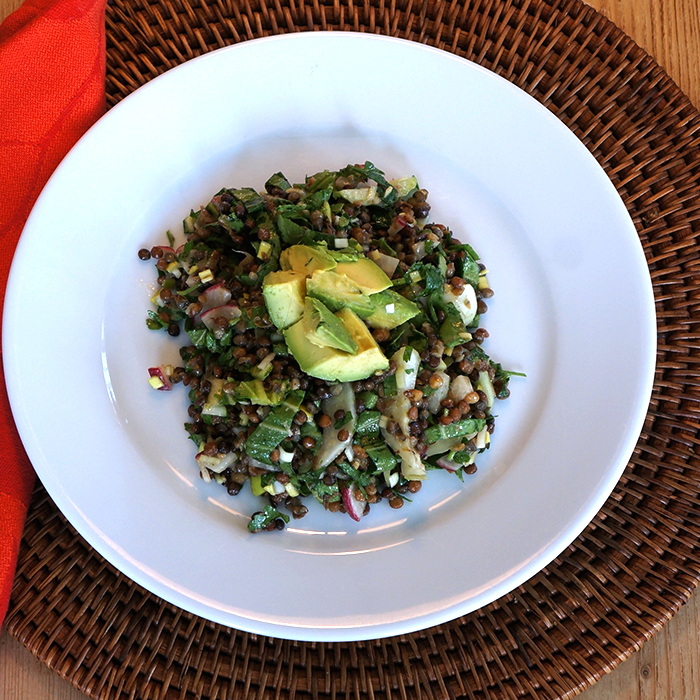 Pour dressing over the lentil salad, toss, and enjoy! This is such an easy, nutrient-rich meal or side dish. You can serve it over a bed of greens, in lettuce cups, or with a side of rice or quinoa - you have lots of choices for this delicious salad. You can substitute any nuts or seeds for the walnuts - all varieties taste great! Garnish it with watercress, parsley or cilantro for added nutrition.